It is becoming a requirement of many areas to wear a restraint to stop the (perceived) risk of out of control skibikes finding their was down the piste without a rider and causing chaos. I think it is an unlikely scenario, but if it keeps the slopes open to skibikers it is a small concession to make. I picked up a "Jumbo Carabiner" off eBay for a few pounds, these are not serious climbing accessories but lightweight items sold to hang up extensions leads in sheds and carrier bags off prams. 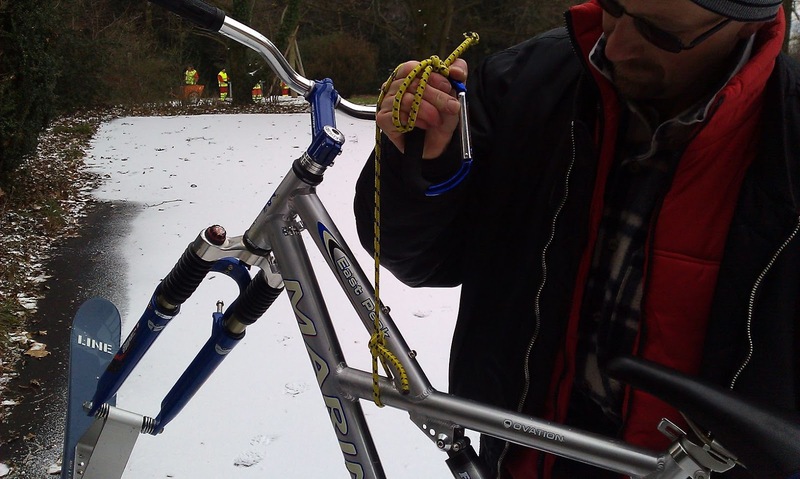 However as my skibike only weighs 10kg it is sufficient to do the job. To allow for some shock loading I bought an inexpensive 1m bungee cord of the type sold for securing luggage to car racks. 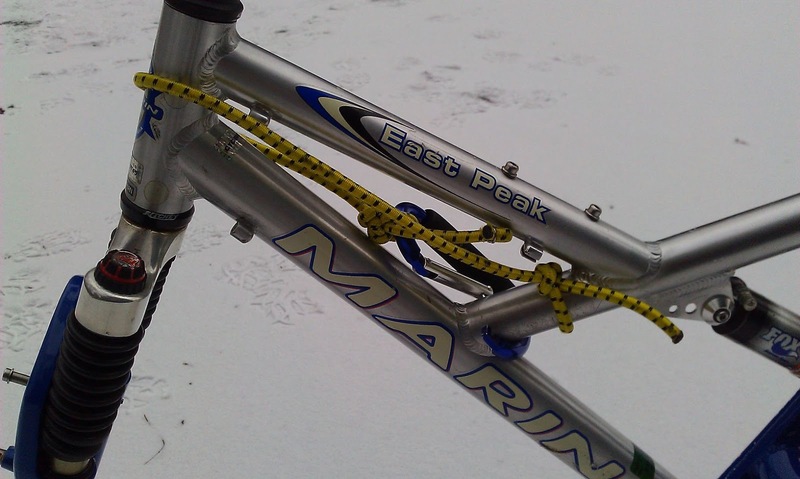 It is in a lurid shade of yellow that catches the eye of lift attendants and shows that I am being a good skibiker. 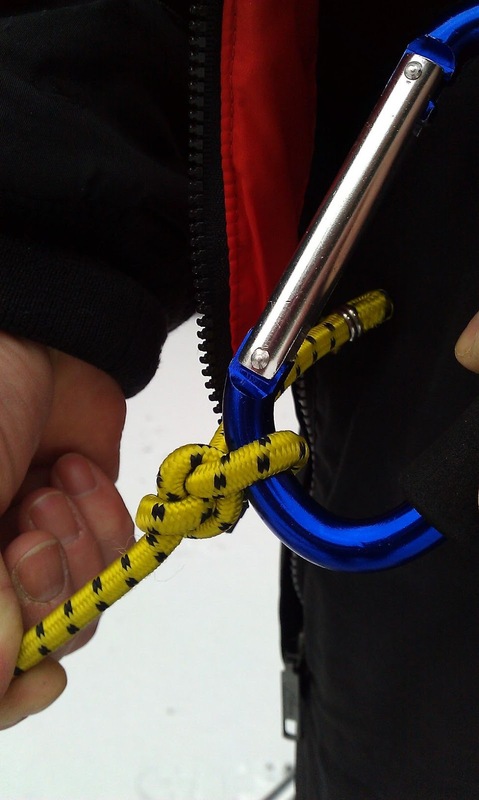 To secure either end of the bungee I used a sailing knot called a "Bowline" which has the advantage that the greater the loading, the tighter it gets. 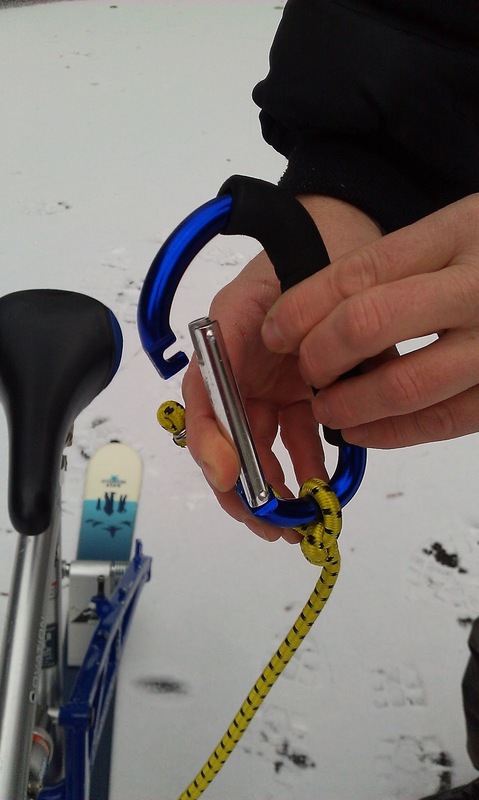 The carabiner hooks into a belt loop on my salopettes, but could also go through the shoulder straps. There is always the danger that in a really bad spill I could loose my trousers! There is nothing like the threat of riding down the piste in your pants to focus the mind on careful risk assessment! 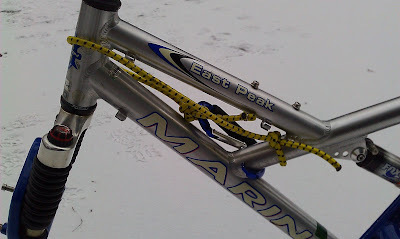 When not in use the ensemble neatly stows by wrapping around the head tube and back on to the skibike frame.Given that the investment was around the price of a cup of coffee in a mountain hut, I am rather pleased and wanted to share the idea with you.